Jonathan Bessick watches as third-grader Bless Carter works on a lesson on his Chromebook. The late Lowell Smith would be proud to see Jonathan Bessick teaching third grade at Sherman Elementary School. Smith, a longtime Mansfield City Schools personnel director and four-year member of the board of education, was a strong advocate of “grow your own,” an initiative to encourage Mansfield Senior High graduates to earn their degrees in education and return to the district to teach. Like others before him, Bessick has done exactly that. A 2011 Senior High graduate, he is in his first year of teaching third grade at Sherman Elementary School. A former member of the Tyger football, basketball and track teams, he also is the wide receivers coach on the Senior High football staff. “I have always enjoyed working with kids. This age (third grade) can make teaching fun – challenging, but fun. It’s an opportunity to inspire them early,” Bessick said. After Senior High Bessick, 26, earned a degree in early childhood education from Ohio Dominican University. 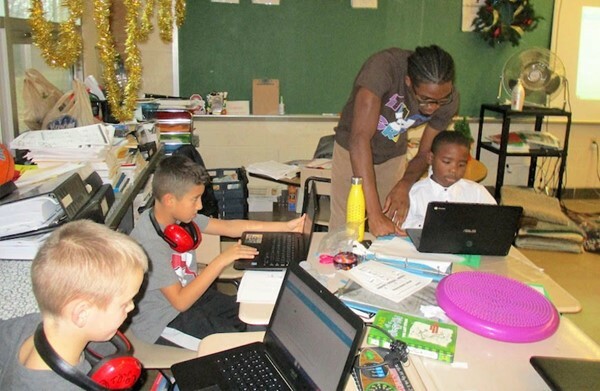 He taught three years in Newark City Schools – two in second grade and one in third grade – before joining the Sherman staff this past summer. The son of retired longtime MCS administrator Renee Bessick and her husband John, he attended Prospect Elementary School and Simpson Middle School before moving on to Senior High. Ironically, at Sherman, Bessick teaches alongside three of his former teachers -- Teresa Fruth, first grade; Bonnie Rice, third grade, and Jessica Snyder, fifth grade. “I wanted to come back to be closer to my family. I have a son here and my parents,” Bessick said. “And I welcomed the opportunity to teach in the district where I grew up. Outside Bessick’s classroom the hallway walls are decorated with students’ drawings of snowmen with cotton balls for bodies. Math equations are written across each one. “Right now, we’re studying holidays around the world, how different countries celebrate. We tie it to our core subjects of math and social studies,” he said. While each day’s emphasis is on academics, Bessick drives home another message, one that he hopes will last a lifetime. “I try to plant the seed of attitude and effort,” he said. “The main thing I want to stress to the kids is how they think – about being positive. I want them to understand that they can’t control everything in their lives, so they must focus on what they can control. Principal Michael Brennan said Bessick brings passion to his work every day. Bessick acknowledges that the work can be demanding from day to day, sometimes moment to moment.